The round gardens in Nærum were designed by a landscape gardener called C.Th. Sørensen in 1948. 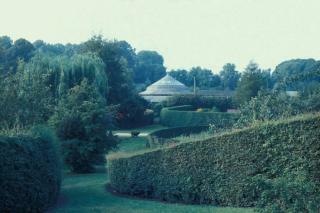 Each of the 40 gardens is bordered by an oval hedge, separated and linked together by a network of grassy pathways. The concept of allotments originated in Germany based on ideas of self-sufficiency and recreation that are now integral aspects of Danish convivial life. The rolling scenery of Nærum is perfect for showing this artistic concept off to best advantage. And rather unusually, the allotments are listed in compliance with the Listed Buildings and Preservation of Buildings and Urban Environments Act. Care has been taken to structure the Nærum allotment hedges to suit the grassy hills. Spaces between the hedges are for children playing and for reducing the risk of neighbours arguing over shared hedges. Neat rows of vegetables and flowers are grown inside the hedges whereas outside the hedges the plants grow freely on common ground. Originally, the grassy paths were to be scythed or grazed by sheep. The hedges are a combination of wild roses, privet, hornbeam, thuja and hawthorn. And residents could choose a high or low, trimmed or bushy hedge. At these allotments, cultivated plots interact with untamed grassy areas in ever-changing harmony.